Where can I search for open positions? To view and apply to current Providence at Kadlec openings, please visit www.providenceiscalling.jobs and enter Richland, WA in the "Where" search box. When are positions posted? How often should I check the website? Positions are posted daily and are posted for a minimum of 7 days. You may want to check back often so you do not miss an opportunity. All jobs that are displayed on our careers website are currently available. If you enter a specific job number and it does not populate in the search results, it is possible that the job is no longer accepting applications, canceled or the posting has expired. Can I use my military title or occupation code to find a job? Yes. Click on the "Military Experience" button at the top of the website. Can I still apply if I do not have an email account? To register, it is necessary to have a valid email account. Many websites offer free email accounts, including: Hotmail, Yahoo, and Gmail. How do I create an email job alert? After logging in, click on the "My Dashboard" tab. On the right side, click on "Access My Profile." Navigate to the "Personal Information" section. Check the box for "Yes! Please send me job alert emails for opportunities matching my profile and application history." Click "Save and Continue" and complete the additional information. How do I opt-out of email job alerts? After logging in, click on "My Dashboard" tab. Go to the Correspondence section and click "Edit." You can then uncheck the box saying "Send me an email notification whenever a new position matching my profile is posted (job posting notification)." By unchecking this box, you are removing yourself from job alerts. How do I find out about job details such as hours and the schedule of a position? If the information is not specified on the job posting, you can request this information from the recruiter, if you are selected to move forward in the process. 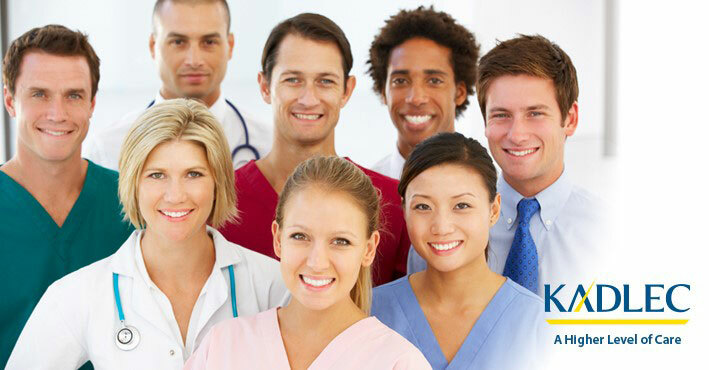 What is the Nurse Extern Program and how do I apply? The Nurse Extern Program offers a unique opportunity for nursing students to build an excellent clinical skill set in a real world work environment. Under the direction of a RN, the nurse extern contributes to the clinical care of patients. Externs have opportunities in a number of clinical and specialty areas with flexible scheduling determined by the student’s school schedule and specific unit needs. Nurse extern positions are posted biannually (May & October) and the program lasts through the completion of the extern’s nursing degree. Start dates typically begin during summer break and over winter break. The program includes an offer of employment at Kadlec Regional Medical Center to nurse externs and requires participation in Kadlec’s tuition assistance program of $3,000 per calendar year. Why does Kadlec want acute care nurses to obtain a Bachelor of Science in Nursing (BSN)? As patient care becomes more complex, there is growing evidence that developing a more highly educated workforce improves patient safety and leads to higher-quality, more cost effective patient care. Are there resources available to help me obtain a BSN? Many Kadlec locations have resources in place to assist registered nurses with advancing their education. You can verify with your recruiter during the hiring process what resources are offered to help support your schooling as programs vary by location. What will my work schedule be while I obtain my degree? We partner with universities in the region, should you choose to attend classes. Your clinical manager will work closely with you to ensure you are able to attend on your clinical day throughout the program. Is there additional pay for obtaining my BSN? Yes. Most of our locations offer a BSN premium. Once you have your diploma, you may present it to local HR contact and the additional premium will be processed for you and a record of your BSN placed in your employee file. In most locations, the premium is currently an additional $1 per hour. How do I create a candidate profile? If you are new to Kadlec click the "New/Previous Applicants" button located at the top of our careers website. You will then create a user name and password for a candidate profile that you can use to apply for jobs and log in for future visits. How do I reset my password and/or user name? On the login page, select the “Forgot your user name” or “Forgot your password” link to have an email sent to you with the user name or an access code to reset your password. The email will be sent to the email address associated with your candidate profile. If you are having any trouble with the access code, please contact jobs@providence.org for technical assistance. How can I unlock my candidate profile? If you have been locked out of your candidate profile, it will automatically reset after 15 minutes. You may try again after that time. If you have reset your password but have not received the email from Human Resources, check your junk mail and spam filters of the email address associated with your candidate profile. Who should I contact for web technical support if I have trouble submitting my application? 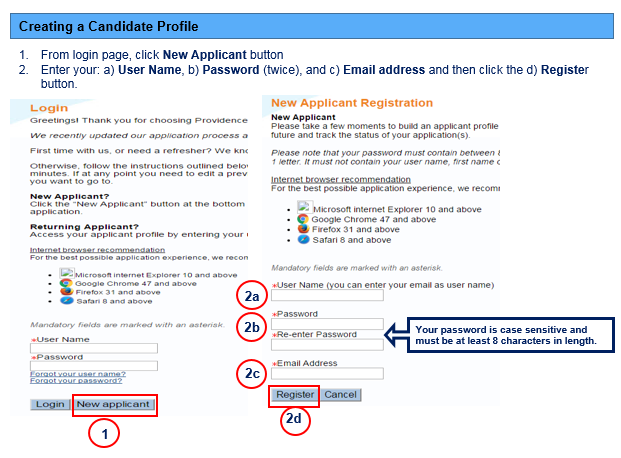 To apply, you will need to first create a candidate profile or log in as a previous applicant. When you find the job posting you are interested in, click "Apply Now" and follow the online prompts. Can I still apply if I do not meet the minimum qualifications for a position? Only candidates who meet the minimum requirements (as per the qualification specifications on the job posting) will be considered. Be sure to review the job description and qualification requirements prior to applying or re-applying. Applying for positions for which you do not meet the minimum requirements could prevent your application from moving forward in the process. Where should I send my resume? You can attach your resume to your candidate profile. After logging in to your candidate profile, click on "Access My Profile" on the right and select "My Attachments." All attachments on your candidate profile will go along with all of your applications. We do not accept paper resumes or applications. How do I submit an attachment to a job application? During the application process there will be an option to submit attachments. You can add an attachment to your application by checking the box "Attach to this application." If the position is still posted, edit your submission and add an attachment to your application. You will not be able to edit the attachment for closed positions. However, you can still upload an attachment to your candidate profile. Why can I not upload my resume? Your resume must be one of the supported file types: Microsoft Word or Adobe PDF. If you continue to have problems, please ensure that you have not loaded the maximum number of 10 documents or have not exceeded the maximum file size of 1.5MB per file. All attachments combined need to be under 4MB total. How can I update my candidate profile? Log in to your candidate profile and you will be able to update your information. Select "My Dashboard" and then select "Access My Profile" on the right side of the page. You will have access to edit the appropriate sections of your candidate profile. How do I complete an application I started, but did not finish? Log in to your candidate profile, go to your “Dashboard” and select the “My Submissions” tab. View your draft and completed submissions. The draft submissions will have a link to “Finish Draft Submission.” However, if the job is closed, canceled, or if the posting has expired, you will not have the ability to complete the draft and submit your application. Why do I receive error messages when I try to move to the next step? You will receive an error if you have missed a required field. Check for a red box near the top of the screen with information on what you missed. Also, be sure to only use the navigation within the submission window. Do not use the back, forward, or refresh navigation from your browser. If you are still having problems, try clearing your browser’s cache (cookies, browsing history, etc.). Refer to your specific browser’s help resources if you have questions about how to clear your cache. When you have successfully submitted your application, you will reach a “Thank you” screen and will also receive a confirmation email from Human Resources. A separate email message is sent upon submittal for each position you apply to. Log in to your candidate profile and go to "My Submissions." Under “Completed Submissions,” you will see an option to "View/Edit Submission." Note: Editing can only occur if the position is still posted. A member of the recruitment team will review your application soon and will contact you directly for an interview if your experience matches our hiring needs. Since we receive a large volume of applications, the process may take several days to several weeks. Please be patient if you have not heard back from us within that time. We want to be sure each application, including yours, gets the proper attention and careful consideration it deserves. For more information, please see our Hiring Process Overview. The majority of the positions at Kadlec require at least a 7 day posting period before applications can be reviewed. Due to the large volume of applications, the review process may take several weeks. A recruiter will contact to you directly if you are selected to move forward in the process. We thank you for your patience as we go through the review process with careful consideration. I meet the required criteria, why have I not been contacted for an interview? We will review your application soon and will contact you directly for an interview if your experience matches our hiring needs. Since we receive a large volume of applications, the process may take several days to several weeks. Please be patient if you have not heard back from us within that time. We want to be sure each application, including yours, gets the proper attention and careful consideration it deserves. Hiring teams may communicate with you by phone or email. Please ensure you keep your contact information current in your candidate profile. Please be sure to check your spam or junk mail folders as well. Will I be asked to submit references? Connecting with candidate peers, colleagues, and leaders is an important part of our interview process. If you are invited to interview, please be prepared to submit a total of 5 contacts. If you are a recent graduate, teachers, professors and instructors may qualify as manager references. Our online reference partner is SkillSurvey. Will I have to do a video interview? Digital video interview technology is a solution that we apply to the interview process for many positions. Early in the interview process, you may be asked to participate in an on demand interview. You choose the time and place most convenient for you. You can use your webcam or mobile device camera to answer the video interview questions. Your responses will help to bring your resume to life! Our digital interview partner is HireVue. What should I do if I am having trouble with my HireVue interview? Please contact HireVue directly for any technical issues. Their tech support team is available 24 hours a day, 7 days a week and can be reached via email at support@hirevue.com or phone at 800-655-4106. To see the current status of an application, log in to your candidate profile and click "My Dashboard." Find the position you have applied to and view the "Submission Status" for the current status of the application. 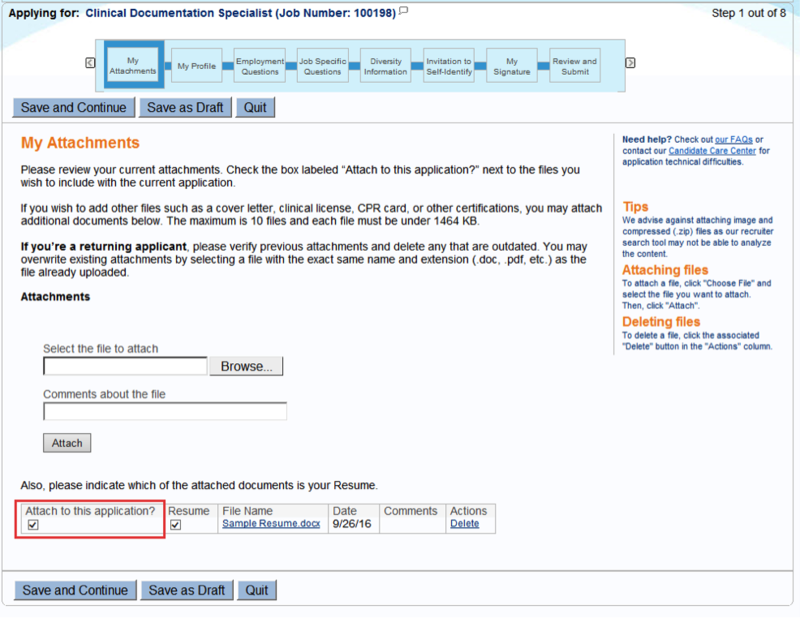 If I withdraw my application or if I am not selected, can I edit my application and reapply? If the position is still posted, you can edit and reapply. However, the system does not automatically update your status to reflect a resubmission and you will not receive another confirmation notification. If you are selected to move forward in the process, a recruiter will reach out to you directly. May I have the contact information of the hiring manager? We are not able to provide contact information for any of our employees for a variety of reasons. If you seek information to address cover letters, you may address cover letter to “Dear Hiring Manager” or "Dear Hiring Committee." 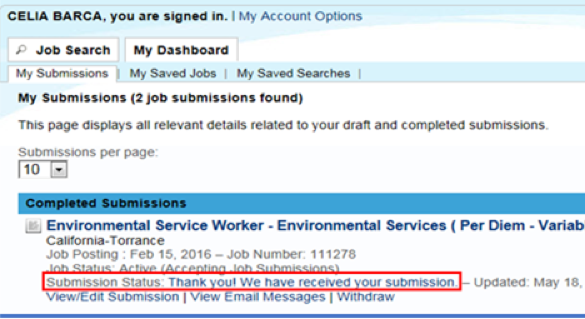 What does it mean if the job to which I applied is no longer posted online? If a job is no longer posted, we are no longer accepting new applications for that position. All previously submitted applications for that job will continue to be processed. Can I see a list of jobs for which I have applied? Yes. Log in to your candidate profile and click "My Dashboard," your job list can be viewed under the "My Submissions" tab in the "Completed Submissions" section. The best way to stay informed about career opportunities is to join our Talent Network, or follow us on Facebook and Twitter. Where can I find more information about becoming a Kadlec volunteer? Where can I find more information about student rotations, internships and externships? I am a current employee. Who should I contact regarding my employment? If you have questions regarding your current employment, career path guidance or job description, speak to your Supervisor or Manager. You may also contact your respective HR Strategic Partner (HRSP) for questions related to employee relations, labor relations and inter-disciplinary matters. To search for your respective HR Strategic Partner, use the HRSP Locator tool.